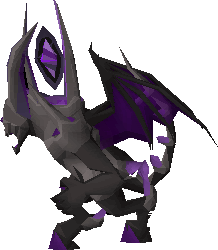 Lurking deep beneath the Catacombs of Kourend lies Skotizo: an ancient demon that lay dormant for centuries, feasting on the intense power of the dark altar. 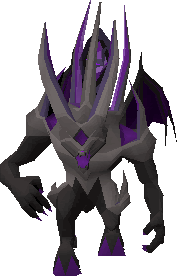 Skotizo is a demi-boss found in a cavern deep beneath the Catacombs of Kourend, accessed using a dark totem on the altar at the center of the catacombs. Warning: Skotizo's lair is an instanced area. If you die you will lose all of your items. Any items left on the ground when you leave the instance will also be lost. Once you enter Skotizo's lair, the fight will begin. Make sure you come prepared, as this demi-boss is sure to put up a fight. This demon has a particular weakness to the Arclight, making it a good choice of weapon. If you are not already in possession of a hard clue scroll you are guaranteed one as a drop, alongside a guaranteed ancient shard. You also have a 1 in 50 chance of receiving an elite clue scroll. On top of these rewards, Skotizo has a generous drop table. You won't find yourself walking away disappointed. There is even a reasonable chance of receiving another dark totem and being able to immediately return to fight Skotizo once more. If you find yourself in trouble during the fight, you can find one-click teleports in each corner of the room. Just remember: once you leave you cannot return! This time of year is troubling for druids. There are all sorts of evil spirits trying to do their worst to harm nature, so the druids in Taverley are doing their best to protect it. Unfortunately, they are having a few problems. Head over to Hotpheex in Taverley to take part in the Midsummer Event. Over the next two weeks the Taverley druids are going to be needing a helping hand, so make sure you check back every day to take on the daily challenges. If you show some support, Hotpheex and his friends may want to repay the favour and reward you. Participating in this year's midsummer event will grant you the rewards from previous years, as well as a brand new midsummer helmet. To celebrate the upcoming release of our treasure trail expansion, we are running an event to challenge your clue-solving skills. Over the course of the next four weeks we will be releasing four clues here on the forums. These clues will be solvable in game, allowing you to unlock one piece of a brand new set of cosmetic gear each week! Once all four have been released, the information they provide can be combined to create a fifth, incredibly challenging clue. The first player to successfully solve this clue will be forever commemorated in game. All players who are able to complete the clue will also receive the fifth and final piece of equipment to complete the set. The first clue will be going live tomorrow and we will be posting on our Twitter account, @OldSchoolRS, as the clue goes live. Arclight has been reworked to correctly account for all of your bonuses before applying its damage boost, making it much more effective against demons. Arclight now has the darklight special attack. Long and curved bones will now restore prayer points in the Kourend catacombs. Corrected the description of a task in the Morytania elite diary to include redwood pyres. Fixed an issue where part of a boat in Keldagrim was floating above the rest. Disabled the use of emotes whilst riding a sled. Corrected some incorrect grammar when talking to Vemmeldo. Corrected some capitalisation when attempting to wield TzHaar weapons without the correct requirements. Corrected some incorrect capitalisation when smithing spears and hastae. Removed a floating post in north-east Piscarillius. Fixed an issue when attempting to pick-lock a door in the Yanille dungeon with both a lockpick and a hair clip in your inventory. Ancient Shards are no longer destroyed if dropped on death. Removed the hyphen in the chop down op on Juniper trees for consistency. Corrected the grammar in game messages when catching implings with your bare hands. Added gender specific text to dialogue during the Fremennik Isles quest. Moved some drawers in a house in Taverley that were blocked by a bed. Corrected the spelling of tattoo on a charter crewmembers examine info. Beads now appear on Wizard Mizgog's table after completing Imp Catcher. Corrected the grammar on the description of the wizard's tower bridge. Added punctuation to the examine info of Arceuus library bookcases. Corrected the grammar on the pottery oven menu. Origami balloons can no longer be launched in the duel arena. Filtered the game message generated when finding damaged monkey tails when hunting maniacal monkeys. Added pineapple pizza and Guthix rest tea to the tournament world chests. Corrected the punctuation on some of Captain Cain's dialogue. Moved some dagannoth spawns in the Kourend catacombs to prevent them wandering near the deviant spectres. EDIT: Add more Kurask in the slayer cave. 5 of them isn't enough. Awesome! however we could use atleast 1 more dark beast spawn. I am glad though that the gendered dialogue is being fixed, as there are several quests which do not recognize if you are female lol. Also, any word on adding in Quest Requirements to Catacomb Creatures that you currently can bypass by simply visiting Zeah?